From 2003: #BillyBallpoint proves how horrible #men can be! 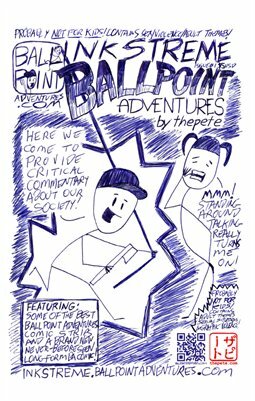 This week: #BarbieBallpoint wonders just how burned #BernieSanders is after last week. From 2003: Gentlemen and #BillyBallpoint prefer #Blondes. Sorry, #BarbieBallpoint! Aww, poor #BarbieBallpoint! She's so sad about the election for #POTUS! From 2003: #BillyBallpoint Meets the New Girl and She's WAY hotter than #Barbie! Billy and Barbie want YOU to vote against the Obvious! Classic #BALLPOINT: For Billy, sometimes a little is too much. #BillyBallpoint knows it's always important to be prepared!